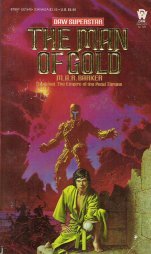 "The American edition of [Man of Gold] welcomes you with a gorgeous Michael Whelan cover, richly coloured and full of life. Only after reading more about the world of Tekumel do you notice that it gets every important detail wrong. Still, the text is the important thing and the text here shines from every page. 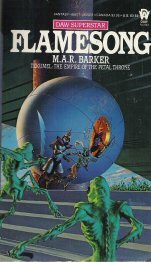 Professor Barker is a better storyteller than you might expect from an academic and this tale of a young priest and the alien society he lives in is a grand tale. Because the world of Tekumel is so unfamiliar to western readers, having more in common with Aztec and Indian cultures, Professor Barker chose to make his hero [Harsan] something of an outsider too, in this case raised as a child by the insect-like Pe Choi. This certainly helps when it comes to explaining the intricacies of the world without sounding too much like, well, a professor. 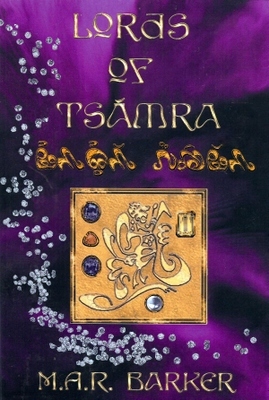 "Enter the world of Tekumel, where the planes of existence are easily crossed and the skeins of fate twist and turn. Harsan, linguist and priest of the god of wisdom, is sent on a diplomatic mission beyond the frontiers of the Empire of the Petal Throne. He and his companions are caught in a skirmish with ferocious foes, both human and alien, and flee in an ancient underground tubeway car in order to save a spoiled and petulant N'luss Princess. Arriving in distant Ghaton, they discover a plan that could change the very future of Tekumel. And this is only the beginning of their adventures." 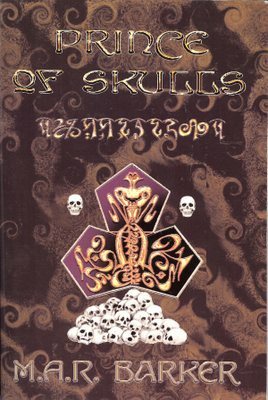 "Travel across the Planes Beyond to the world of Tékumel, where things are not always as they appear and a simple mission can turn deadly. Korrúkka is part of a Tsolyáni political mission to find a peaceful solution to the war between the Livyáni and the people of the isolated Tsoléi Archipelago. After seeing the wonders and secrets of Holís Isle, the talks break down and the Tsolyáni delegation becomes mysteriously ill. Left to die from the fearsome Plague of the White Hand, the mission appears destined for an untimely end. Waking up on the shores of Livyánu, the remnants of the delegation must find a way to stop the spread of this deadly plague before it spreads and destroys all of civilization." through the lands of Tekumel, where poison comes in many forms. 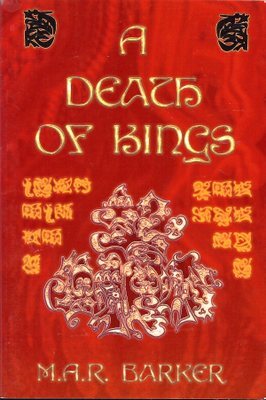 An assassination, a betrayal and a political refugee prompt the Emperor of the Petal Throne to send Harsan and his comrades on a precarious mission of diplomacy and rescue to far off Salarvya, a land where the death of the king has unleashed chaos. Hounded by the Khomorg, a sect of fanatics who dye themselves blue and slaughter those who do not join them, they are forced to sail further East, deeper into Salarvya and madness."